Blah! And this is why I should publish all of my work! !!!! I need to post my work more often!!!! If you haven't read the Hack-a-Day link above, "Mike" posted a video about modding an Atten APS3005S power supply to quiet the always-on fan. He changes out an in-line zero-ohm jumper for a thermostat switch (probably the usual cost reduction nonsense that happens, but see below about the new version of this supply). He also "upgrades" the fan to an ultra silent one (not entirely sure if has similar CFM, though, which is fairly important). If you're going to do this, make sure it's got at least as much airflow, or better yet, test the power supply under a fairly beefy test load and make sure none of the primary components (transistors, transformers) exceed a reasonable temperature at full load. After all, this is a bench supply in a test environment, and will be taking quite a bit of abuse from your experiments. Worked on this problem a few months back because I got really annoyed. Everything the other poster said is more or less completely true--this power supply is loud. Oh, and a clarification: the CircuitSpecialists CSI530S supply is equivalent to the Atten described in the post. I went along another approach, though. The one I had was actually someone else's that I borrowed for one of those projects where you end up needing 3-4 different power supplies for one reason or another. Problem is, that meant I really didn't want to mess around with the board too much, lest I accidentally destroy the power supply, so I spliced the control board inline with the fan power wires. I also wanted to be extra safe about not overheating anything in the supply because, well, it wasn't mine. Anyway, here are some pictures. The supply works wonderfully now--at low currents (<0.5A-ish, for most voltages I've used) the fan doesn't turn on at all. Otherwise, it roars, but I guess I'm cool with that for that much power. It turns out most of the cost in many linear power supplies comes from the large heatsink necessary; this linear bench supply pulls off having 5A output primarily by replacing that large heatsink with a wimpy metal plate and sticking a huge fan on it, which might not be optimal, but definitely how they achieved the $80 price point with 5A. Thermistor mounted on one of the power transistors, with thermal glue and Kapton tape for wire strain relief. The control board, spliced in between the fan power cabling and mounted on the rear with double sided tape. As I said before, I did this project a few months ago. The power supply pictured is actually in New York now, so I can't physically get access to it. I've also lost the schematics (well, I never saved them in the first place--this was one of those <1-hour design-on-scrap-paper exercises, and I figured it wouldn't be interesting enough to save), but if anyone wants to reproduce the circuit, ask me and if there's enough interest I'll try to redesign it. What would I do if I did this again? Well, there's one more significant heat source that might need to be protected--the transformer. While it's not directly blown at by the fan, it's definitely in the path of the airflow. Might make sense to have another thermistor there. Additionally, a cheap PIC10F/12F (or ATTiny for you Atmel guys) would've probably made the whole endeavor a lot more flexible. I recall not doing that because I was in the mood for some analog and figured it'd be simpler than pulling out a programmer. For some time I was considering publishing this and making mini PCBs because a few other people I know did a group buy of these and they all have extra-loud power supplies. Unfortunately, I soon found out that this was unnecessary: the new model Atten power supplies added the fan temperature control feature. I ordered a couple of them off of SRA Soldering Supplies for a club, and found out that all of them already had built-in fan control. Anyway, if you've got any questions, just ask. If I find time I'll try to answer them as best I can. So I sort of forgot to update after the second post. I'm going to leave this post as a general current project status list for now. - The direct-to-pcb printer project is being slowed to a crawl because I just discovered that barebones PCB (4pcb.com) has 1 day turnaround on plain ol' PCBs without being ultra-expensive. 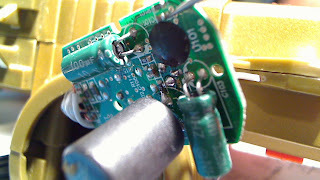 The lack of a soldermask, honestly, is good enough for me. I never cared to bother with silkscreens for prototype projects--the extra time spent getting the damned silkscreen on the parts aligned and non-overlapping is probably more than the extra time it takes to print out a piece of paper with the guide and to work it out manually. That, and I need an adjustable HV power supply and HV probe for the transfer section. I'm fairly certain that the issue is simply that I need more volts. . .
Maybe when I have a whole summer free (which doesn't look like it's going to happen for at least a year or two. . .I hope the PCB prototyping market is actually that slow!) I can get around to working on this. Or maybe I can figure out some way to delegate. . .
- Effects pedal. You'll hear about it eventually. - Solid LED Dance floor tiles / LED throwies / LED room decor / LED projects. Currently active. - UV exposure box. The head is done! Still need to make a box and paint it. Probably about 30W output UV power! - Stainless steel etching / photolithography. - Lazer Tag - postponed until the next time I get bored with the taggers. They're SO much fun! - remote standalone computer power switch. I want to be able to turn on or off my remote server with a low power, secure Internet-connected device without needing someone to do it manually. Seems easy enough--if I'm lucky, I'll be able to use one of my old dev boards to pull it off. - low cost standalone digitally controllable (SPI, I2C) ultra low standby MP3 player with sequencer (?) - animatronics and pranks. Much easier now with LPC1111 on the market! hm. I thought I had more. I guess I'll be updating this list. This is a Nerf (previously Tiger) "Lazer Tag" Phoenix LTX tagger. There's a lot of talk and background on this guy online, so if you're really interested Google further. 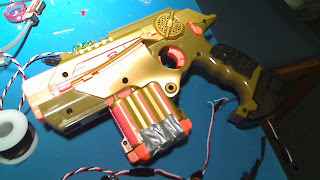 This is indeed marketed a toy laser tag gun, but as it turns out, its performance far exceeds most toy laser tag guns. In real-world testing, the range limit of the gun seems to be on the order of 400 feet or so, and it's pretty trivial to make hits at half that distance (with good aim, of course). So first, a little background on how these guys work: despite their name, most of these taggers don't use lasers for the actual hit transmission. Instead, they use IR LEDs, much like your infrared TV remotes. In fact, the whole system is essentially a well-mounted TV remote and receiver with optics to keep the beam narrow. So when you're playing, you actually do need to use the iron sights to really hit anyone reasonably in the game--the aim is fairly realistic. 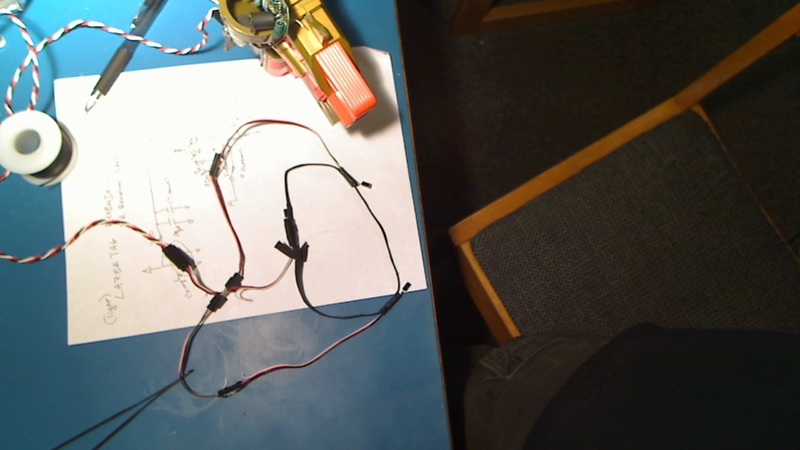 I left out the red LEDs (there's two pins for flashing all four on and off, and it's completely separate from the IR receiver, probably to reduce noise). The indoor mode, as it turns out, only changes the receiver sensitivity by changing the bias on the PIN photodiodes. The main IC in the circuit is under an epoxy blob, but their very well documented patent actually tells you exactly what it is: a "KA2184." Unfortunately, this chip is at least a decade old (back from when the patent was submitted), but it's quite obvious what it does. Every time you fire a shot you need to more than an infrared pulse--you need to transmit information on what team you're on and what kind of hit it was. Most importantly, you need to be able to distinguish the hit from, say, light bulbs or the sun, so the IR signal is typically modulated by a 38kHz or some similar frequency carrier. What's inside the receiver IC isn't much different from an RF receiver IC--you have an amplifier in front (in this case, a transimpedance amplifier for I-V conversion), an AGC so that you can still demodulate weak signals without saturating the receiver with stronger signals, a bandpass filter to filter out the actual signal of interest, and a demodulator to output the actual digital signal. It's really just OOK (on-off keying) for IR instead of RF. If you Google hard enough, you'll find a couple of equivalent part numbers, one of which still has an application schematic online. Chances are, they use some equivalent part. These ICs are generally called "infrared amplifiers" or "infrared preamplifiers." They're pretty unpopular these days; only a few chinese manufacturers and Atmel (T2526 and family) seem to still make them, probably for very low price point products like this toy or other applications which require more control over the receiver circuit. I don't know any distributors which stock them. The unpopularity of designing receivers like this ties directly to why my attempt to wire up external sensors didn't work. If you've ever played with any infrared transmission scheme, you've almost certainly run into nice little three pin infrared receiver modules. These modules have the PIN diode (random tidbit: PIN stands for p-type - intrinsic - n-type, and is a type of semiconductor junction used in most photodiodes) and IR receiver ASSP in a single plastic module, which is often shielded internally by a metal leadframe. These seem to have, for the most part, displaced the old approach with a separate PIN diode and receiver ASSP because the noise and shielding issues you've got to deal with if they're not in a single package. In this case, the designers probably chose this path to meet the price point ($25 per tagger isn't much to work off of given how much is in this gun) while still having three receivers for 360 degree coverage for the receiver dome. If you used three separate IR receiver modules, you'd also have to deal with somehow combining the three outputs. This is, circuit-wise, easy because a lot of these modules are open collector, but what if the signals are received with some phase shift due to variances in the AGC, or what if two sensors receive two different signals from two different taggers? There's a good chance of losing lots of hits in heavy firefights rather than at least taking a hit from the strongest signal (which is what happens thanks to the AGC). The ideal way to do this is to process all three IR receivers separately, but that's probably more horsepower than the dinky toy-grade MCU they used probably had. So back on topic--the noise issues are exactly what I ran into (and what I expected, but I wasn't totally sure and I figured I'd try it out anyway). I desoldered the three original PIN diodes from the circuit, wired them up some servo connectors (I have a bunch of servo extension cable assemblies) and taped the whole thing to piece of elastic (like these MilesTag sensors http://www.lasertagparts.com/mtsensors.htm). And the receiver spat out so much noise that the tagger refused to fire, probably because it kept on entering the routine which prevents firing while being shot or thought that it was firing at itself from an infrared reflection. A cap helps to filter out the noise, which I noticed when I stuck a scope probe on, but it also degrades the performance of the receiver and reduces the effective distance, so that's pretty useless. The only real thing to do is to improve the shielding of the cable I used (which was barely twisted pair), but you don't really want an expensive and heavy piece of coax just to transmit a silly 38kHz signal. So for now, at least, this project is scrapped until I feel like wiring up actual IR receiver modules and replacing the dome's receiver entirely. Well, I hope that first real post had some interesting info that'll help you on your own endeavors. Happy hacking! P. S. Yeah, I meant to crop all of those images, but I'd rather finish this up and start on working on the laser printer controller than reupload these photos. I apologize for the generic template and lack of content, but I figured this would be the best way to get this site off the ground. Well, it's a good idea to introduce myself in the first post--I'm Samson, I'm a Caltech undergraduate in Blacker Hovse, and I'm studying Electrical Engineering. Most importantly, though, electronics is probably one of the defining things about my life and I love working on cool electronics projects whenever I can. I'll be posting on the progress of all my new projects, maybe little EE lessons here and there, and most likely a bunch of rants I can't stop myself from posting.